We enjoyed a great weekend of performances that included the opening of Mauckingbird Theatre Company’s The Importance of Being Earnest and a puppet parade on the last day of the Puppeteers of America’s National Festival, Puppet Festival (r)Evolution. These are just some of the stories the press has been covering for both Canary clients. 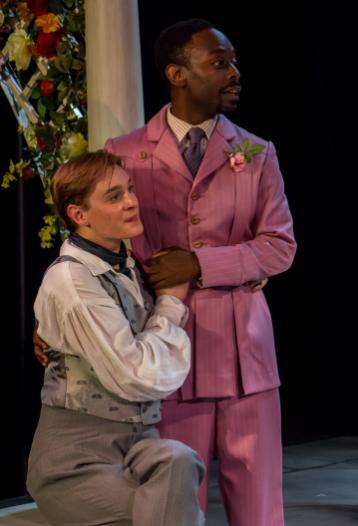 Mauckingbird’s crowdfunding achievement caught the attention of Technically Philly when they surpassed their Kickstarter goal in July for Oscar Wilde’s The Importance of Being Earnest, their most ambitious production to date. James Ijames spoke to GPhilly about the gender-bent production, which matter-of-factly casts two men in the roles of Gwendolyn and Cecily. Costume designer Marie Anne Chiment gets another shout out in Uwishunu’s preview, and Mauckingbird co-founder Lindsay Mauck talks about her first appearance in a Mauckingbird production as Dr. Chasuble with Philadelphia Gay News. Headlines might have a tough time getting over puppet puns just waiting to happen, but Philly feature stories had no such strings attached. Philadelphia City Paper’s cover story by Shaun Brady went behind the scenes with Philly puppeteer Aaron Cromie, and The Intelligencer had its own studio visit with Joseph Cashore of Cashore Marionettes. The Philadelphia Inquirer’s Stephan Salisbury gave readers a peek at the festival in a beautiful weekend feature and the Philadelphia Daily News included a bit of a puppet primer in with their picks and highlights. There are great photos from puppet building workshops and some silly voices audio at Newsworks.org. Festival press also went national when it was picked up by the Associated Press. Puppet Festival (r)Evolution is over, but you can still catch The Importance of Being Earnest, running through August 25 at the Off Broad Street Theater, 1636 Sansom. Tickets and info at mauckingbird.org.